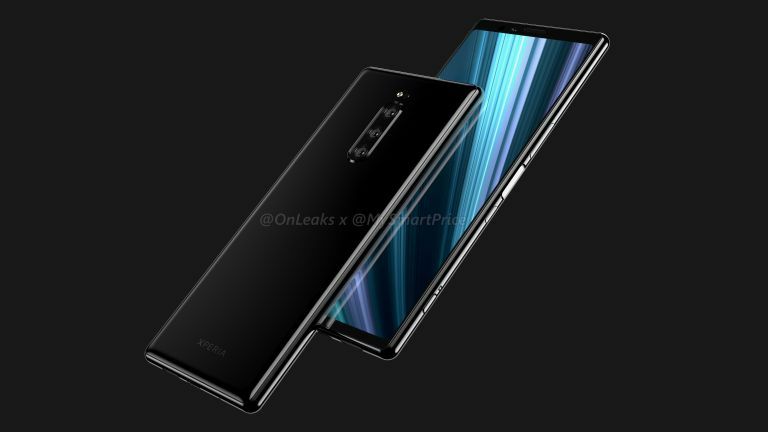 Sony announced its flagship Xperia XZ3 back in August, so it makes sense that we're starting to hear whispers about its successor, presumably branded Xperia XZ4. Reliable tipster OnLeaks has teamed up technology blog MySmartPrice to release a series of renders based on leaked CAD models for the as-yet unannounced device. If these renders are accurate, Sony looks set to forgo the increasingly omnipresent notch design trend, popularised by the iPhone X last year. As such, the next-generation Xperia will likely keep a similar screen-to-body ratio as the Xperia XZ3. It looks set to sport a 6.5-inch display with a 21:9 aspect ratio. Since it doesn't have a notch – or a small circular cut-out, like the Huawei Nova 4 – the front-facing camera, speaker grill, proximity and ambient light sensors all appear to be squeezed into the top bezel above the display. But it's on the back of the handset where things get really interesting. Sony looks set to include a triple-camera system – a first for its main Xperia XZ line. Considering the Xperia XZ3 only had a single camera on the back, it would be a big step-up to see Sony jump to a triple-lens system on its next flagship. However, it might be necessary upgrade given that the Huawei P30 and Samsung Galaxy S10 – due to launch in early next year – are both widely-tipped to launch with a similarly endowed camera set-up. Sony has dabbled in multiple-camera set-ups, notably with the dual-camera on the Xperia XZ2 Premium. Unfortunately, there's not more information on the specs of the camera for Xperia XZ4, however, we'd expect to see bokeh-style blur on portrait shots, optical zoom and improved low-light performance at the very least with that number of cameras on the back. One notable absentee from the Sony Xperia XZ4 is the rear-mounted fingerprint scanner. Earlier rumours suggest the company won't be using an in-display ultrasonic scanner in its next flagship, either. It looks like Sony will return the sensor into the power button on the side of the device, like it has done in the past with phones such as the Sony Xperia Z5. Based on these renders, it looks like the company will continue to use the same premium glass finish on the rear that characterised the Xperia XZ3 last year. Disappointingly, there's no sign of a 3.5mm headphone jack in these renders. Last month, OnePlus became the latest Android manufacturer to ditch the universal audio port with the launch of its OnePlus 6T handset. Samsung is widely-tipped to eradicate the 3.5mm headphone port from its Galaxy Note 10 next year, too. Sony is not doing anything extraordinary by moving to USB-C and Bluetooth audio connections only, but keeping the 3.5mm intact could've been a nice differentiator for the firm. Sony will likely unveil its Xperia XZ4 during the Mobile World Congress tradeshow, which is scheduled to take place in Barcelona in February next year. However, there are some doubts about the longevity of the Xperia range following a crushing earnings call from Sony. The Japanese company released its fiscal second quarter results earlier this week – three months to the end of September 2018 – and the numbers from Sony Mobile are abysmal. The business only managed to ship 1.6 million Xperia-branded handsets during the quarter – the lowest ever for Sony. Shipments were down by over half compared to the same period the previous year. Ouch. Once again, Sony Mobile has lowered its shipment expectations accordingly – the third consecutive downgrade. It now forecasts only 7 million smartphones shipped during this fiscal year. For comparison, this is around half of what Sony Mobile shipped in the last fiscal year. According to Sony, the main volume decline has been led by lower sales in Europe. It's unclear whether this will impact the development of the Xperia XZ4, or its scheduled release date early next year.